In the old detective novels there is always a hotel on a cliff top, a room with a corpse and a butler holding a skeleton key which opens all the doors… in fact, hotels and the accommodation facilities are generally the typical users of a master key system, where each door opens with its own particular key, but there is a key which opens all the doors, precisely the famous skeleton key. The reason is obvious: each guest must have access only to their own room, whilst the hotel staff must be able to access all the rooms in order to carry out the various service requirements. 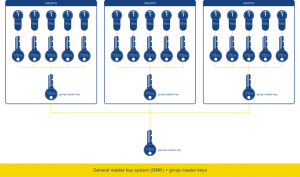 The different keys open only one door, the group master keys open all the doors of a group, such as all the rooms on one floor, whilst the general master key opens all the doors. 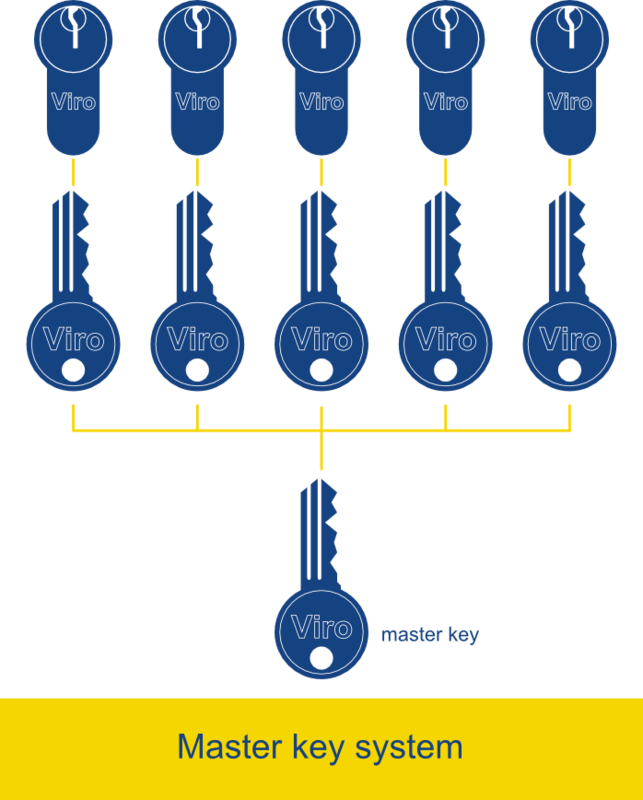 The different keys are used by the guests, the group master keys are used by the staff on the particular floor and the general master key is used by the management. 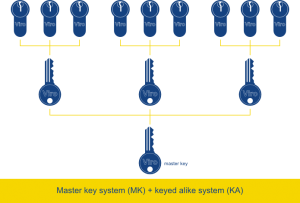 Another type of structure which normally uses general master key systems consists of hospitals and communities in general. From the point of view of access management, these structures substantially have the same issues as a large hotel. So, for example, the matron can be given keys which open all the rooms for which he/she is responsible, the head physician can be given the master key which opens all the doors of a particular department and the management can use a general master key. 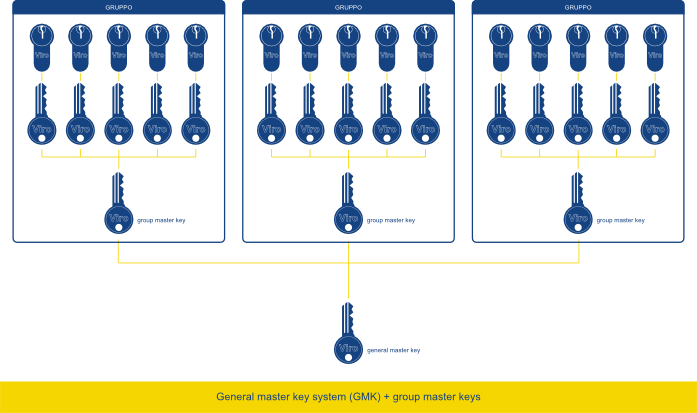 Master key and general master key systems can be combined with other special systems, such as keyed alike systems, where the same key opens more than one door. 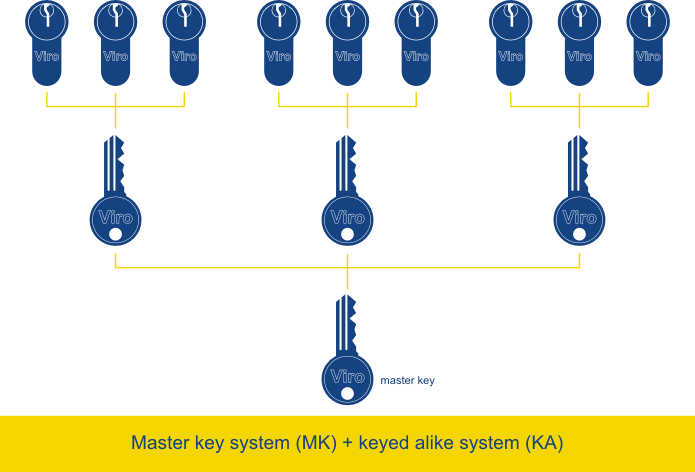 In this case, the different keys of the system can, for example, be used to open a group of locks, rather than just one. This system can be useful, for example, in a residence where every guest must be able to open not only the main door to the room or apartment but also the other doors through which access is necessary (garden gate, garage, cellar, etc.). 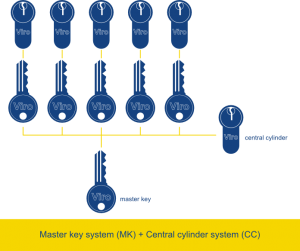 Alternatively, a master key system can be combined with a central cylinder system, in such a way that the individual keys (and, of course, the master key) open not only the respective locks of the system but also another shared lock (e.g. the main external access door to the rooms of the community). What features must a master key system have? Firstly, in order to set up master key systems, and even more so general master key systems, the manufacturer must use high quality materials and precision equipment. 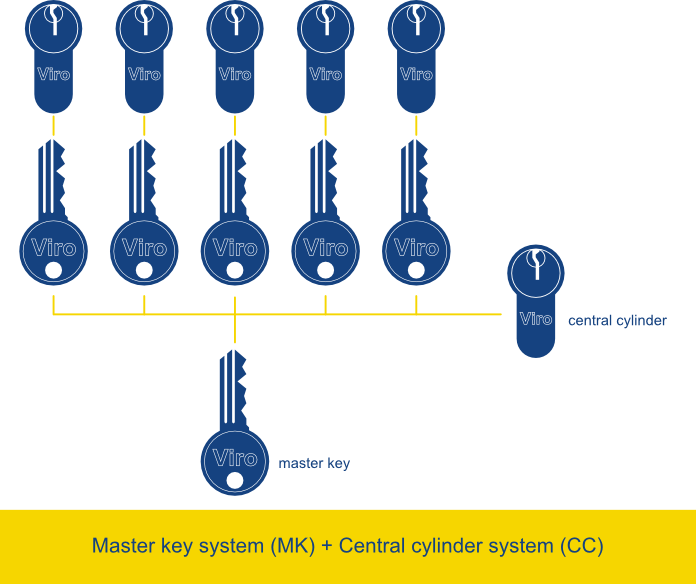 In fact, whilst each pin in an ordinary lock is made in one piece, the pins in master key systems are divided into 2 parts, and in general master key systems they are even divided into 3 parts, all in the total space of just a few millimetres and with the need to deal with differences in the order of a few tenths of a millimetre between one bitting and the other. Another important feature is the possibility of extending the system, adding new keys and new locks, simply by notifying the system code to the manufacturer, without the need to exhibit a sample. A third element to bear in mind when choosing a supplier for this type of special system is the speed of execution. 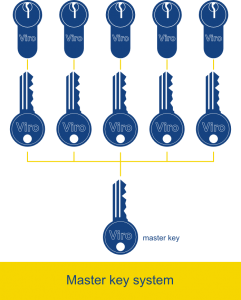 Viro, for example, is able to provide a complete and fully customised system in about 3 weeks. 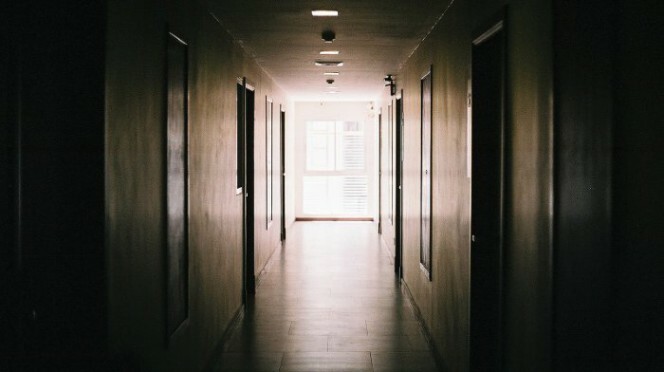 In short, in order to have the convenience of a skeleton key, or master key, you don’t need to be in an Agatha Christie novel, you just need to be in a building such as a hotel, a hospital or a community, and explain your needs for managing the access points to a hardware store or to your trusted locksmith, who will be able to contact the appropriate company to provide this type of product and service. This entry was posted in Locks and Cylinders and tagged special key systems on 9 February 2015 by Mara Rossi.